Sharks have been swarming around southern California beaches for weeks. NPR wanted to know more about why, so we placed a call to Chris Lowe, a professor in marine biology and head of the Shark Lab at California State University at Long Beach — or rather, we tried. Lowe was offshore on a boat trapping sharks to tag, and at the appointed time for our interview, Lowe had his hands full ... of shark. Morning Edition producer Justin Richmond, who was on the boat with a microphone, delivered a play-by-play as Lowe and two of his students from Cal State Long Beach tugged on a net. "They're literally catching a shark right now!" Justin said. It was a great white shark — although not a big one. It was a baby, about six feet. The boat they were on was a 12-foot whaler. The idea was to tug the shark alongside that little boat, then hoist it up on the deck of a bigger boat — yes, in an all-too-appropriate Jaws reference, there was a bigger boat — and there, the researchers quickly performed surgery, implanting tracking devices on and in the baby shark, so she could be studied later. All this action was happening only about 30 feet from Long Beach. In that neighborhood, Justin said, everybody has been talking about the sharks right there in shallow water. After Lowe gently lowered the baby shark back in the water, he was able to describe what he thinks is going on. Lowe says though these beaches have been hot spots of nurseries for white sharks, what is different now is global climate change. "It's changing our ocean temperatures, it's changing our ocean currents," he says. "What it's doing is it's making conditions more favorable for some of these babies." 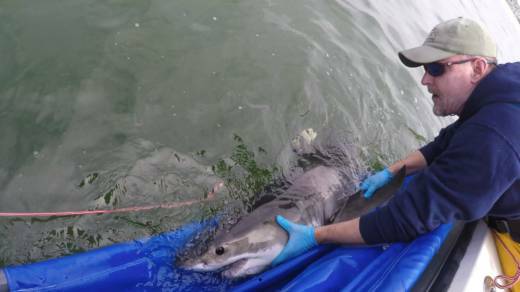 Los Angeles-area beaches are basically the nursery for white sharks in the northeast Pacific, he says. "And we need those sharks. They're really important in keeping our oceans healthy. So while the public always has some concerns about the fact that there are white sharks off their beaches, what they have to remember is that these are babies and they're coming to these beaches for the same reason they do: they want a safe place to hang out and enjoy life." Lowe says that baby sharks are usually at least as afraid of people as we may be of them. Morning Edition producer Justin Richmond and Morning Edition editor Amy Isackson and digital producer Heidi Glenn contributed to this story.